En español | Since finding a retired teacher living in a chicken coop and creating the National Retired Teachers Association (NRTA) in 1947, Dr. Ethel Percy Andrus had been committed to the cause of affordable, age-friendly housing for retired teachers. By 1952, she had decided to build NRTA’s own experimental retirement community where retired teachers could live graciously with dignity and purpose. In 1954, with financial backing from friends and colleagues, Dr. Andrus purchased the defunct Grey Gables Inn in Ojai, California, an attractive semi-rural community about 75 miles northwest of Los Angeles, some 15 miles inland from the Pacific Ocean. Dr. Andrus’ commitment to Grey Gables was so strong that she and her long-time friend and colleague, Ruth Lana, moved to Ojai to take personal charge of the project. They were pioneering no less than a new model of retirement for America. At that time, the only housing models for older persons were nursing homes — known as rest homes — and subsidized housing for the poor. At Grey Gables, residents would not be isolated, lonely or limited in their possibilities. They would be encouraged to remain engaged with the world — attend concerts, theater, classes at the community art center and meetings of the historical society; and to join Ojai’s civic, business, cultural and political groups. In turn, the retired teachers of Grey Gables were able to use their considerable knowledge and experience to enrich the Ojai community. They, for example, volunteered at the community’s art center, museum, library, churches and schools. Opened in the fall of 1954 (and expanded in 1957), Grey Gables comprised 14 buildings set on 8 acres of landscaped gardens. There were 75 residential units located in the various buildings, two of which were two-stories and the rest one-floor ranch-style buildings. There were studio units and one- and two-bedroom apartments. Residents furnished their own apartments. Community rooms included a spacious lounge, lanai and a dining room where meals were served family-style. Recreational facilities included an outdoor heated swimming pool, shuffleboard courts and a hobby room with pool and ping pong tables. Within easy reach of the complex were nature walks and bicycle paths, fishing, golf, riding, tennis and bowling. Dr. Andrus founded AARP in 1958 and, in 1959, she added to the Grey Gables complex “Acacias,” an innovative 25-bed nursing home to accommodate Grey Gables residents. 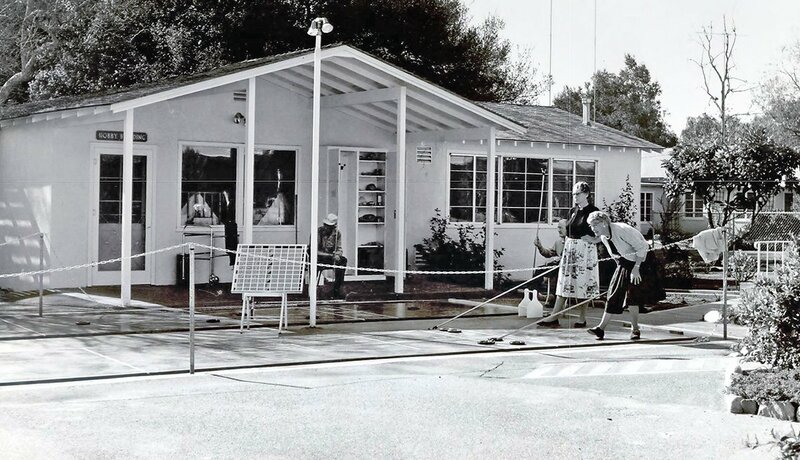 Acacias was expanded to 50 beds in 1967, when personal care apartments were also added. They proved to be a very popular and instructive intermediate step between Grey Gables’ independent living units and Acacias. Grey Gables residents who needed less than the 24/7 care of a nursing home were able to live an average of five years in a personal care apartment before requiring transfer to Acacias. This revolutionary concept of continuous care as residents aged is common in many of today’s assisted-living facilities. Was every Grey Gables idea a rousing success? No. Dr. Andrus’ generosity and the very low inflation rates of the mid-1950s led to an innovative formula for establishing residence: a one-time entrance fee ranging from $5,000 to $7,500, plus a “life care” contract with a low monthly fee of $135 that could never be increased. 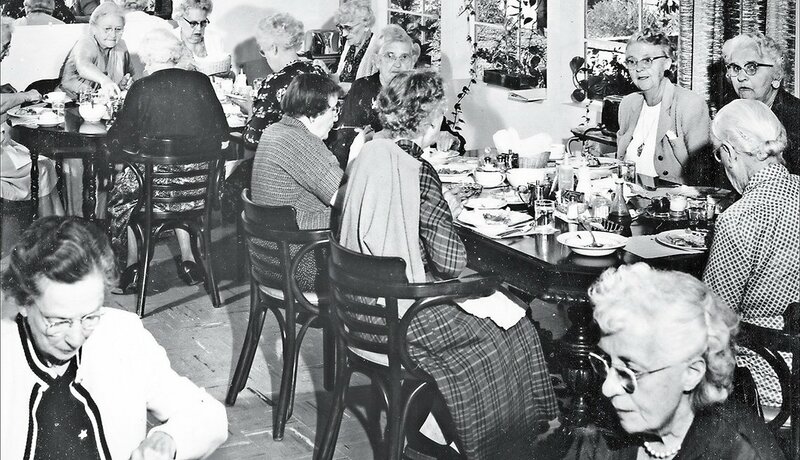 Most Grey Gables residents were women, and the excellent facilities and lifestyle allowed many to survive longer than expected — well into their 80s and even 90s. Unfortunately, the high inflation of later years caused the fixed, low payments from long-time residents to become seriously inadequate to cover expenses, resulting in severe financial woes for Grey Gables and leading to the eventual sale of the property by AARP. Nevertheless, Dr. Andrus’ Grey Gables experiment is viewed through the lens of history as an overwhelming success. Written up in many national publications and professional journals, Grey Gables helped change the very image of retirement years and became a model for future retirement communities nationwide. Today, AARP is a champion of the concepts of universal design to help you build or retrofit a home that allows you to age in place. In addition, the AARP Network of Age-Friendly Communities is expanding on Dr. Andrus’ vision of retirement community. The Network is helping towns and cities become great places for all ages by adopting such features as safe, walkable streets; better housing and transportation options; access to key services and opportunities for residents to participate in community activities. 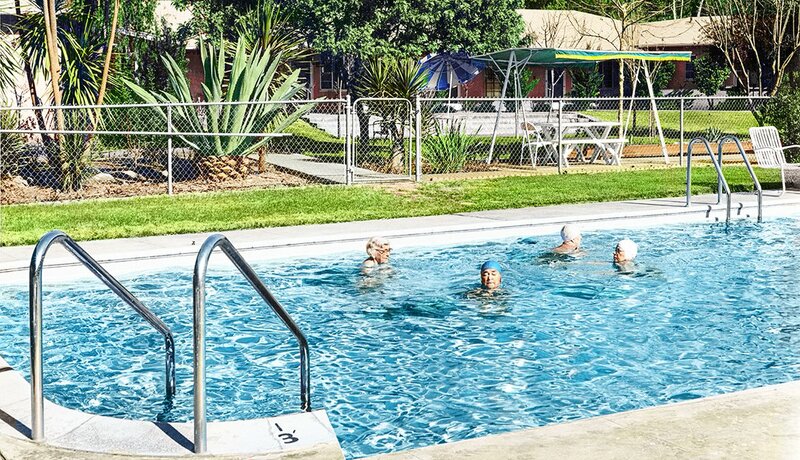 Residents of Grey Gables enjoyed a heated swimming pool. Residents were served three wholesome meals a day in the communal dining room. 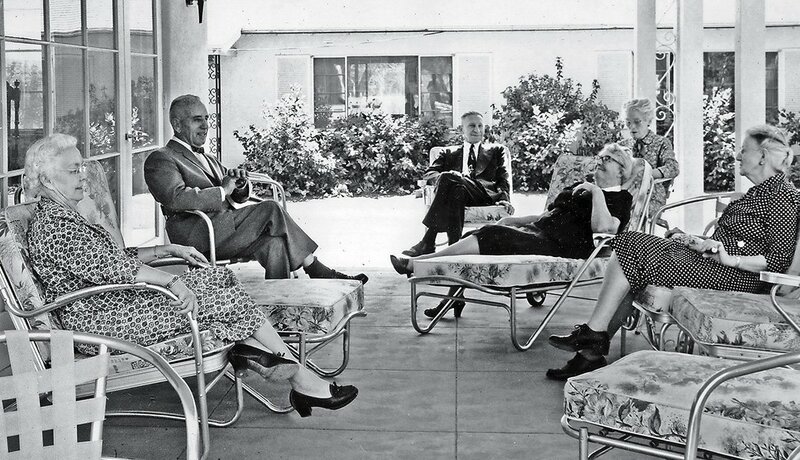 Residents relaxed and socialized on the porch. Shuffleboard was a popular outdoor activity. 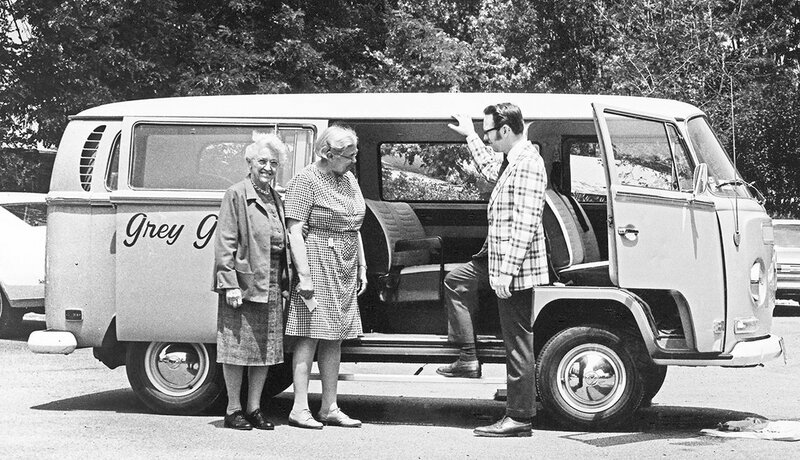 The Grey Gables van took residents to run errands and on day trips.